Annunziato Amendola, MD renowned orthopaedic surgeon from Duke University will be installed as the 45th president of the American Orthopaedic Society for Sports Medicine (AOSSM) on Saturday, July 9th, 2016, during the Society’s Annual Meeting in Colorado Springs, CO.
COLORADO SPRINGS, CO – Annunziato Amendola, MD renowned orthopaedic surgeon from Duke University will be installed as the 45th president of the American Orthopaedic Society for Sports Medicine (AOSSM) on Saturday, July 9th, 2016, during the Society’s Annual Meeting in Colorado Springs, CO.
Dr. Amendola is a professor of orthopaedic surgery and Vice Chair in the Department of Orthopedic Surgery, and the Chief for the Division of Sports Medicine at Duke University. He is involved in the sports medicine and foot and ankle fellowship programs. His clinical and research interests focus on improving the understanding, prevention, treatment, and rehabilitation of sports and activity-related problems of the lower extremity. 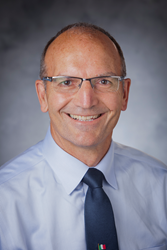 He recently moved to Duke, from the University of Iowa, where he was a Professor of Orthopedic Surgery, Director of Sports Medicine and held the Kim and John Callaghan Endowed Chair in sports medicine from 2001-2015. Western Ontario in London, Ontario. Prior to joining the University of Iowa in 2001, he was an Associate Professor and Chief of Orthopedic Surgery at the University of Western Ontario University Hospital. He completed fellowships at the University Hospital Western Ontario; the University of Verona, Verona, Italy, the Crystal Clinic in Akron, Ohio and took part in the AOSSM European Sports Medicine Traveling Fellowship. Throughout his career, Dr Amendola has received numerous peer- reviewed grants, and published more than 200 peer-reviewed articles. He has won several AOSSM research related awards, including the Excellence in Research Award, Cabaud Memorial Award and the O’Donohue Award. In addition, he received the Achilles Award from the International Society of Arthroscopy, Knee Surgery and Orthopaedic Sports Medicine (ISAKOS), the Samson Award from the Canadian Orthopaedic Association, the Roger Mann Award and the Leonard Goldner Award from the American Orthopaedic Foot and Ankle Society (AOFAS), and the Kappa Delta Award from the American Academy of Orthopaedic Surgeons (AAOS). He has been an invited lecturer nationally and internationally, as well as authored an extensive number of book chapters and served as editor of three textbooks on orthopedic sports medicine and arthroscopy. Dr Amendola is a Diplomate of the American Board of Orthopedic Surgery, Fellow of the Royal College of Surgeons of Canada, and Diplomate of the Canadian Academy of Sports Medicine. He is also an active member and/or board member of many orthopaedic and sports medicine organizations, including the American Board of Orthopaedic Surgery, ISAKOS, AAOS and the Arthroscopy Association of North America (AANA). He served as president of the Canadian Academy of Sport Medicine in 1997. Dr. Amendola is married to Alison and they have 4 children: Richard, Julie, Andrew and Christine. The American Orthopaedic Society for Sports Medicine (AOSSM) is a global leader in orthopaedic sports medicine education, research, communication and fellowship, and includes national and international orthopaedic sports medicine leaders. The Society works closely with many other sports medicine specialists, including athletic trainers, physical therapists, family physicians, and others to improve the identification, prevention, treatment, and rehabilitation of sports injuries. AOSSM is also a founding partner of the STOP Sports Injuries campaign to prevent overuse and traumatic injuries in kids.